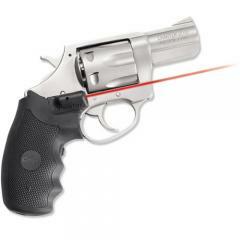 Crimson Trace LG-325 Laser Grips for Charter Arms Large and Small Revolvers FREE SHIPPING! The Charter Arms Large/Small Revolver Laser Grip by Crimson Trace (model no. LG-325) quickly adds a high-quality, comfortable and adjustable laser sight to Charter Arms' revolvers. The grip is crafted using premium rubber and given an additional rubber over-mold layer for improved comfort. Instant activation is achieved by simply pressing the activation pad, conveniently and naturally placed by the index finger groove. Activating the laser can also be done through the master on/off switch located at the base. Once activated, the laser dot provides accurate sighting at 50-feet with a high-visibility .5-inch diameter dot. The grip doesn't require any gunsmithing, easily attaching to firearms using the two provided screws. ©2002-2019 CopsPlus.com: Crimson Trace LG-325 Laser Grips for Charter Arms Large and Small Revolvers FREE SHIPPING!